Looking to buy safety gloves in Rochester NY, Ithaca NY, and Western NY at competitive prices & with exceptional service? 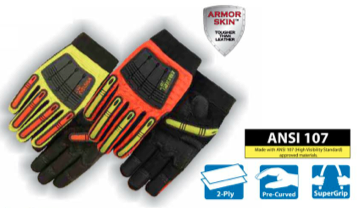 The Duke Company proudly carries the finest Safety Gloves – Knucklehead X10 Safety gloves in High Visibility Yellow and High Visibility Orange. Highly engineered, durable gloves that enable 4 (four) different wearing options: unlined, waterproof, Kevlar lined or winter equipped. Protection enabled via durable thermoplastic rubber back hand and finger protection. Pre-curved finger design to reduce fatigue.